It is not often that I spend any time in Court these days. As a director of Ten-Percent Legal Recruitment (and the usual person responsible for suing errant clients who fail to pay) I have made regular forays into County Courts across the UK over the years since I stopped practising to make applications for Charging Orders on blocks of flats, houses, office blocks. I also regularly apply for Summary Judgement when the inevitable happens and solicitors’ firms fail to turn up to small claims hearings. I don’t think I have ever been in a case involving a defendant who has actually turned up! However I am involved in a larger case at the moment as a witness. The case is fast track and hence large enough to warrant the use of Barristers and Solicitors, although Ten Percent’s related case is a small claims matter. I am dictating this on the way home from Court after spending a frustrating day observing just how much better the County Court service could be operated. There does not appear to be much justice going on but rather simply an administrative procedure running out of control, without very much thought for the end result. The Courts I was attending, which shall remain nameless, is in the London/South East area. The case I am involved with is piggybacked onto another matter, which is a fast track matter worth a five figure sum. My own case is a four figure sum and as a result is in the small claims track. Approximately one year ago the trial Judge in the matter we are piggybacked onto gave a direction that our case was to follow on automatically at the end of the fast track matter. The Court administration staff promptly lost my file and failed to list it for a hearing. This meant that I had to get up this morning at 4.45 am, drive to Crewe Train Station, park for £8, pay £93 single for a second class ticket (this was an advance ticket and I saved £20 by buying it the night before) and get to Court without actually knowing whether or not our case was going ahead. However, once I had arrived at Court it was pretty clear that the our connected Fast Track matter wasn’t going anywhere in a hurry either. The Court staff had lost the bundles of documents. There is probably nothing particularly unusual in this. However I learnt today that the County Court we were in has a policy of disposing of all bundles to do with any case between each Court hearing. This means that if you have a Court hearing that is adjourned the Court will immediately throw away your bundle and expect you to prepare another bundle in time for the next hearing. The Claimant in the case I am linked to has to pay £500 after each adjournment simply to ensure that this happens. There are over 1,000 pages of evidence in his case, yet the Court Service see fit to throw these bundles away and pulp them after each hearing. I am not sure what a lay person would make of this, but as a solicitor myself I am absolutely horrified that the Court Service can charge the fees it does for hearings and applications and yet allow an inefficiency like this to happen. It gets worse. The for the Claimant in the fast track case were aware of the policy of throwing bundles in the bin. At the last trial hearing the case was adjourned through no fault of either party, and the Claimant’s solicitors obtained a Special Dispensation for the bundles to be kept and not thrown away. However, so distrustful of the competence of the staff at this particular Court were the Claimant’s solicitors that they actually instructed an outdoor clerk to attend at the Court a few days before the hearing to check that the bundles had not been thrown away. This they did, at a cost of c£100. It was duly confirmed that the bundles had not been thrown away. However, when we attended for the hearing today the Court Usher informed the Claimant that in fact the Court had no record of his bundles and they did not have a copy of them. The Claimant and his solicitor were informed of the Court Policy and told that it was not the court’s problem. When the Claimant’s solicitor challenged this and said that a Clerk had been paid to come and view the files and check they were there, the Court staff informed him that the files were definitely not there and the one filing cabinet in the building where files were kept had been checked thoroughly (this is a huge Court with many hundreds of cases going on every week I should imagine) by two members of staff and the bundles were not there. After much imploring and pleading by the Claimant’s Solicitor, the Court Usher walked up three flights of stairs to do a last check herself (bearing in mind this is the third check for these bundles which contain approximately 1,000 pages) and after about 20 minutes she returned with the files. This may not seem a particularly important point, but the cost implication of this was a wasted 35-50 minutes of Court time, the cost of the Barristers for each side in the case, the cost of the Judge and his court room time waiting for the case to come through, and the potential cost to the Claimant if the bundles had not been there because it would have had to been reproduced and re-printed for later hearings (at a cost of £500). Furthermore, the limited court time available on the day because of this delay and others meant that there was insufficient time to deal with the case as a full hearing even if it did go ahead. My impression of the staff at this particular County Court is that they appear to be from a generation of civil servants who find themselves in a very fast moving and changing environment without the knowledge, equipment, resources or training to keep up. Technology generally appears to have left the court system well behind and the very thought of contacting the Court by email is probably about 20 years away. All through this case I have been contacting the Court and I am yet to get a response to any fax or email or letter sent. In other areas of the country this is definitely not the same. For example I can speak highly of my dealings with Dudley County Court and Birmingham County Court – both of which appear to be very efficient and responsive to any queries on files. I can often get a response at a lot of courts simply by faxing the court and telephoned back within the hour. The Court we were in today never gets back in touch. When you phone up to speak to them you will often be told that they will ring you back when inevitably they fail to do so. Letters are not answered and neither are emails. The case itself has facts that I need not bore you with here, but suffice to say that on entering the Courtroom I remain very surprised in the way that litigation is conducted in this Court. The Judge is an extremely friendly chap. However, throughout the hearings I have been to in these cases he seems to have a particularly strong rapport and relationship with barristers representing claimants and defendants, spending a considerable amount of time during the hearings reminiscing about Judges he has worked with or cases he has worked on in the past and making light-hearted comments with the barristers. Furthermore, so far in this case I think he has failed to rein in the worst excesses of Counsel and has not kept the case moving. The barristers and the judge continually went on today about costs. I kept a note of the time and I think that the time spent by Counsel and the judge going on about costs probably cost more than the actual costs that were being argued about! If I was a lay person attending these hearings, I would be horrified at the thought that I was paying for my barrister to sit and chat with the judge, or discuss their own costs, discuss their own arrangements for getting to court and to hear the Judge’s own personal thoughts on litigation and the costs of it these days. I would probably think that the time being spent in court was simply being spent to waste time, build up costs and not particularly get anywhere in a hurry. Images of the Charles Dickens novel, Bleak House, kept going through my mind. Nothing appears to really have changed. Apologies in advance if some of these are a little ignorant! The Judge in our case seems to have forgotten hearings he has attended before and almost starts again every time we’ve been to Court. For example he’d forgotten today that he’d given a Costs Order at his last hearing 4 months ago, and in fact this was re-opened and argued yet again because of this omission. In these types of cases, would it not better to have independent arbitrators, appointed by the court, taking the place of the judge? The arbitrators could take depositions from each side, consider the legal points, and make recommendations to the court for disposal. The judge could then read the paperwork, read the recommendations, hear any additional evidence if required and make an informed decision. The very thought of preparing document bundles in today’s modern world just seems completely stark raving bonkers. There seems to be no conceivable reason at all why a Court service charging the fees they do for use by Claimants and Defendants do not have facility for bundles to be put into PDF format. These could be put on computer screens to be viewed by everyone in the Court Room. If this were the case then I suspect the cases could be dealt with so much more quickly. Have the CPR rules up on a screen as well so that whenever one of the Counsel refers to them a button can be pressed to immediately screen this on the wall so that everyone in the Court room can see the relevant rule and there is no need for the Barristers in question to read them out or go through each point. This is the same with any references to text books and court cases, which again have to be referred to, often photocopied and handed in as Authorities, pages referred to and points made. I think the age of all those concerned in litigation has been left to get on too much. There are obviously very able judges and barristers out there who are in their twilight years, but the ones I have seen seem to be living in a different world. The judge today talked about costs of £60,000 being astronomical (it doesn’t seem a lot anymore to me! ), technology is available via a very old computer thing that sits on their desk and is generally ignored, and there seems to be a lot of reminiscing for the good old times before CFAs and litigants in person. Resources need to be put in, but perhaps if this is unworkable, the courts could be reserved for the last hearings only and commercially based arbitrators used in the first stages of litigation (a compulsory measure). I am aware that there are large-scale redundancies going on in the Court Service and resources get less and less all the time. However my own experience of Courts is that when they are run efficiently they can function well and Claimants and Defendants in cases can get communications through and cases can be progressed rapidly. In Courts like the one I was in today, this simply does not happen and I wonder whether these Courts need to be identified as failure and someone give them a good kick in the proverbial behind. I suspect that my rantings on this are somewhat influenced by my lack of sleep having got up this morning at 4.45 am to attend a hearing that has yet again been adjourned because of yet another late application from a Defendant, coupled with the delays caused by the court procedure involved at this particular court. If trials could be set down to enable applications to be heard within a limited time before they start and then the trial takes place come what may then perhaps speedier justice could be meted out on behalf of Claimants and Defendants. Afterall, the reason parties might delay in civil cases is often nothing to do with justice or the case at hand, it is to do with squirrelling away assets so that the other party cannot get their hands on them, if that particular party is unsuccessful in its application. I fear that the Court is aiding and abetting Claimants and Defendants in this by failing to ensure that cases are brought to a speedy conclusion and at minimal cost. What do you think? Is this critique fair or completely misguided? Please comment below. Recruitment Agencies Failing at Fastest Rate since 2007. It has been reported today in the Recruitment Press that recruitment agencies across the UK are failing at a faster rate than seen since 2007/2008 according to a new report. It is estimated that a first two quarters of 2012 will see a record number of recruitment agencies go into administration and get brought out by larger rivals. At particular risk are those with large public sector contracts and medium sized businesses with large overheads. Recruitment agency client bases are disappearing as more and more firms start to use and develop their own internal networks and cease to use conventional recruitment agencies to conduct their general hiring for them. In one large multinational company it was recently reported that just 2.5% of their recruitment spend was through employment agencies and the remainder was done using internal mechanisms and external networking. Recruitment agencies have seen an unparalleled reduction in the amount of business they are able to deal with. Unless a recruitment agency is of a particular size and handling very large corporate accounts on a bulk basis, the days of surviving on a few permanent placements each month have long gone. Recruitment agencies now need to be employment law consultancies, able to assist with HR processes, provide very low and competitive fees, add advertising to their service and generally do a lot more for their money. Things may change as the jobs market expands again, but as it stands recruitment agencies who do not change are in for a very bleak future indeed. Changing the way recruitment agencies work is fairly straightforward, provided you are prepared to be innovative. One such example is our own company, Ten Percent Legal Recruitment. We recognised that in future recruitment spend is going to be something practice managers can no longer splash out on (we find practice managers are the most reluctant to apply new techniques and tend to focus specifically on the old style techniques of using a long list of expensive recruitment agencies to fire CVs through). Partners of law firms and owners seem more geared up to changing their habits. We have altered our services completely to enable every one of our clients to recruit as many staff as they need for less than £800 a year. Over 45 firms have signed up to this so far and they include sole practitioners, LSC funded firms, large regional practices, commercial firms and high street firms. This is quite a change from the standard conventional contingency fee recruitment of the usual recruitment agency and makes a considerable difference to the costs per client. For details please come and visit us. You can sign up online or call us for further details. We are changing the face of the recruitment industry and anticipate driving costs down for everyone (apart from Magic Cirlce firms who are a world apart!). 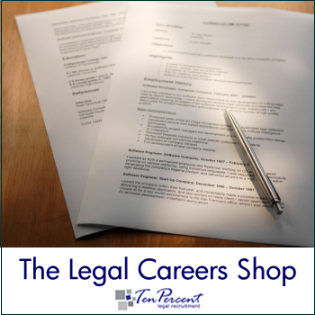 Ten-Percent Legal Recruitment - Legal Recruitment for Solicitors, Legal Executives, Fee Earners, Support Staff, Managers and Paralegals. Visit our Website to search or download our Vacancy Database or view our Candidate Database online. Legal Recruitment Agencies and PDF Files - avoid the latter! We have recently had about 30% of all CVs sent in by candidates in Adobe Acrobat pdf format. Please think twice before converting your CV and sending it in this format. It drives us insane! Adobe appears to be one of the most unstable platforms around and crashes our computers when it clashes with Firefox and Windows Explorer and anything else thrown into its' path. I know that some law firms ask for CVs in pdf format - simply because it makes it easier to read and reduces the risk of viruses, which Microsoft Office appears to be highly susceptible to. However, as a legal recruitment agency who invested in technology some time ago to enable automated upload of CVs onto our system quickly and efficiently, .pdf files are the bane of our life! Every time one gets sent, we have to reformat it into a word document, and if we want to use it to send out (*with your consent of course), we have to remove all the text boxes that our specialist converter software throws into the mix for us. This can take anything from 5 to 20 minutes. I know they look good, and to be honest if I was sending out my own CV I may consider pdf files, but it does not really assist your application. Please think twice before sending them. I may be slightly crotchety when writing this after just converting 11 CVs in a row!